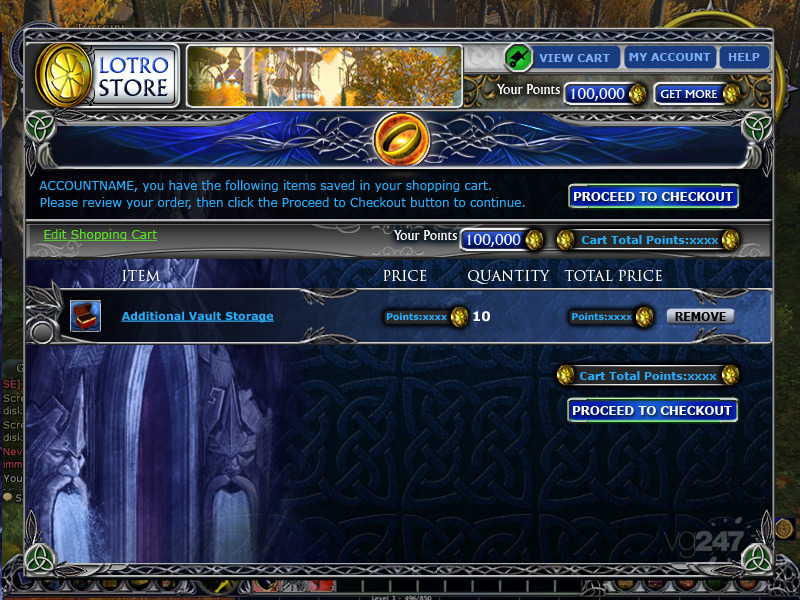 When Volume 3, Book 2 for LOTRO launches across North America and Europe, it will introduce the new free-to-play pricing model to the game, as well as extending game’s story this fall. A North American Beta for the new content launched on June 16, so if you are a player, head on over to the official site to sign up. Meanwhile, hit the break to find out what’s coming to the game. Hint: Horse country, graphics, and a new feature for clothes addicts. In Volume 3, players will be able to head south once again and follow along the Fellowship’s journey with the path leading into Enedwaith with is south of Eregion. Granted it will not be as big as Mirkwood, but Enedwaith is looking gorgeous from what we have heard. Those familiar with the lore will know that this area sits atop Gondor with (squeal!) Rohan to the east of it as well as Isengard. When Volume 3 begins, player will journey with their new pals, the Dunedain Rangers, into the new zone to seek out Aragorn in the land ruled under Saruman the corrupted wizard’s heavy hand. So expect lots of Orc, Goblin, and Uruaki foes, we recon. To help tell the story, Turbine is once again implementing session play, and this time instead of playing an Elf or a Dwarf, you will fill the shoes of a Ranger, re-living the events that unfolded through his eyes. So, finally we are getting into what is, in our opinion,the best part of the tale – Two Towers territory. Once Isengard is added, one can only assume that Helm’s Deep is next – which is where many came to the aid of Rohan. No word yet on whether this will be added into Volume 3, or part of it’s own expansion, but the best part? According to Turbine mounted combat for the area is still on the docket, so that glimmer of hope is back. Don’t expect Rohan or Isengard before 2011, though. Now, onto some of the nifty changes to the free-to-play model. First off – know this – if you are a subscriber, we’ve been told that you will not notice a change at all in the game. This should come as a relief to those who are afraid of change or who were worried that the game would be watered down (yours truly – SN). The only difference will be the points you accrue throughout the game. 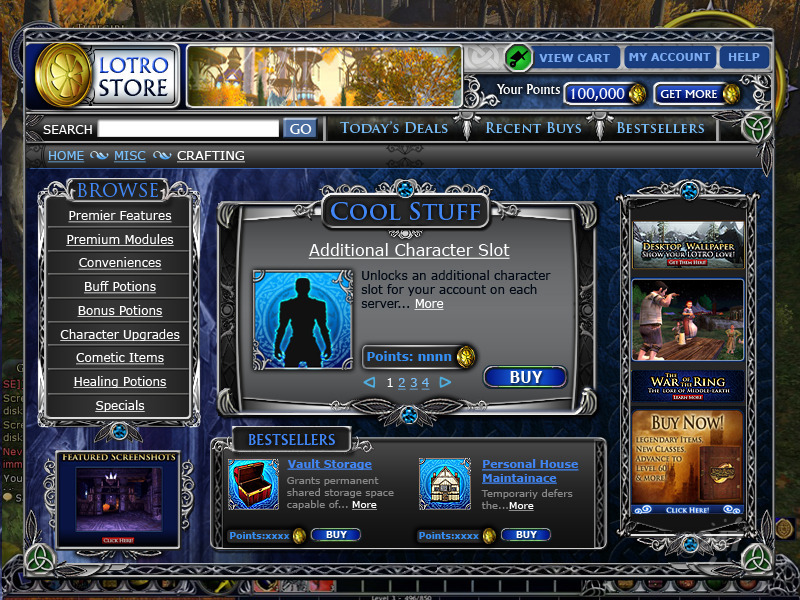 The points will be made available for use in the new in-game store, where you can buy cosmetic items, and potions. Don’t worry – these potions will not affect the economy in the game or hurt the market for buff potions on the auction house. We weren’t told much on what these potions were, but just know that the new elixirs will not affect the racket you have going on the AH. The store (pictures below) will also allow FTP and Premium players to access quest packs by region along with the potions and clothing.P ricing is currently not set, but it is believed that each point costs around ten cents. So, say you want a robe that runs 30 Turbine Points – that is 30-cents real money. That’s according to a source of ours, so we will check with Turbine on this a bit more. Wardrobe has changed as well, and will be like a closet to house all your dresses, hats, eye-patches, robes, and other non-gear items that are crafted or won through the game’s lottery or token turn-ins. This will save a lot of bank and pack space, and is expandable via 20 – 50 slots and is a standard item for those that are VIP. 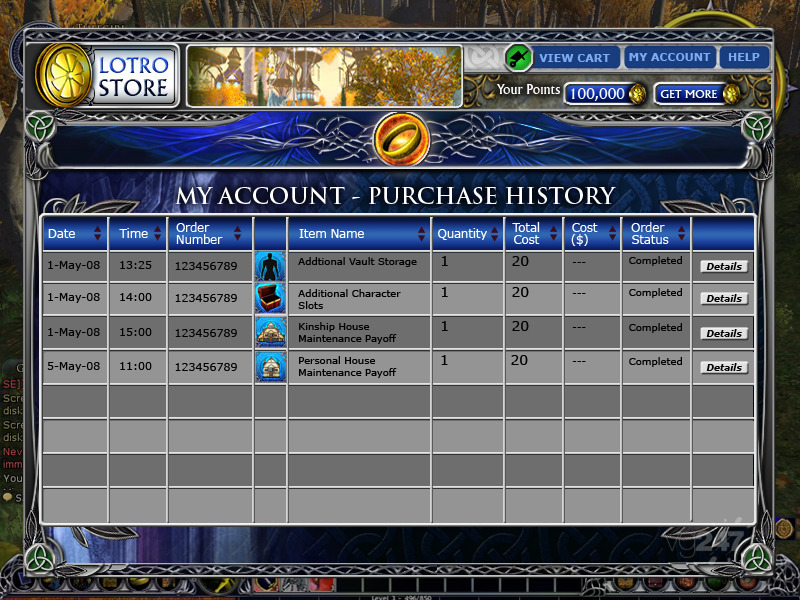 Wardrobe storage can also be bought as a one-time thing for FTP and Premium players. It goes without saying that on the cosmetic level, there will also be some housing changes, although our source at E3 said that Turbine is not ready to talk about that bit yet. Still, it’s nice to know improvements are on the way – hopefully these include more chests and decoration hooks. Another thing in the works for future expansions, is a new hobby. So far, the only one available is fishing. No word on what the new hobby or hobbies are – but it’s good to know that those not into fishing will have other options. Some gameplay changes will also come into play eventually, as Turbine is looking to scale raids and instances by level. 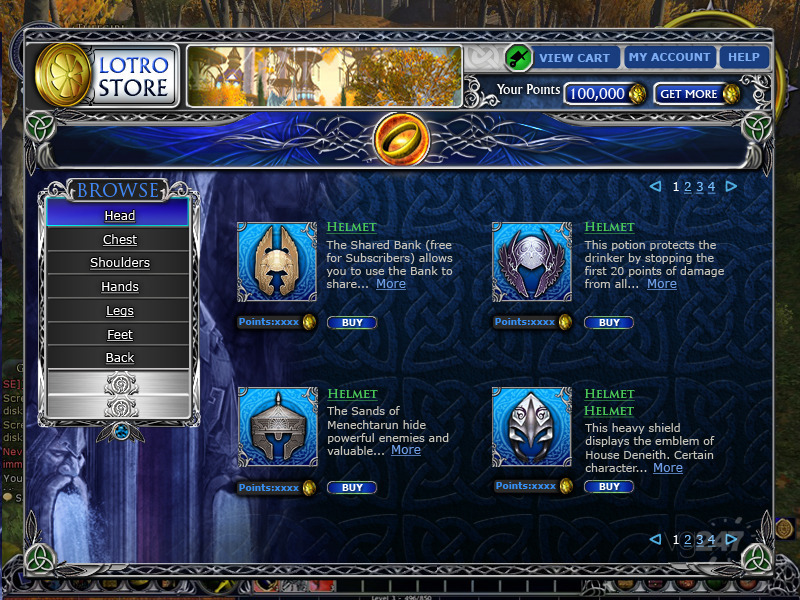 The developers did this with Volume One a while after Moria came out, so players could complete quests requiring a group – due to players not being able to find one. The way this works, is players will be able to jump into a raid or instance from anywhere in the game and its difficultly will depend on the number of players in the instance. So, if you decide to solo a particular instance, your health meter will go from, 7K to 22K – as a rough example. You will not be able to solo 12-man raids though. Just join-in from anywhere. Last, but certainly not least, the game will finally support DX11 when the expansion hits in the fall -as if the game could look anymore beautiful. 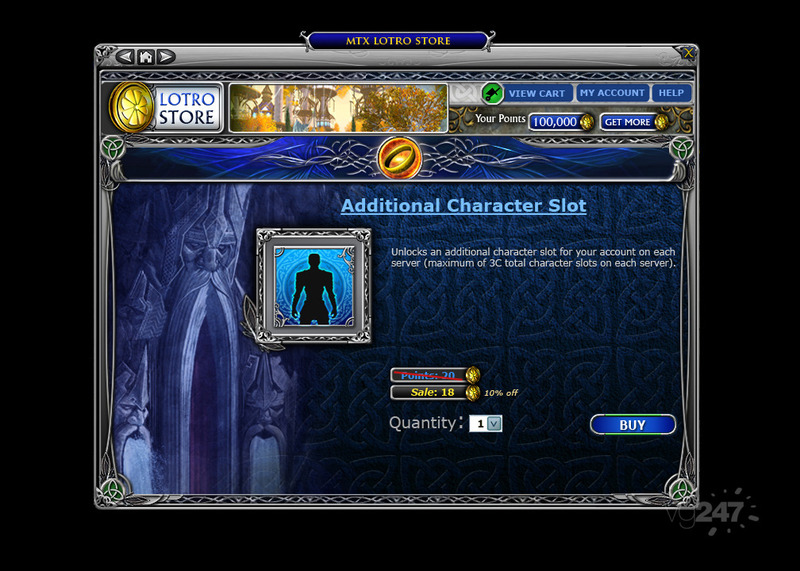 Hopefully, this gets folks excited about the changes coming to LOTRO instead of making them quit the game due to misinformation and just all out paranoia. Granted, yours truly was one of those in the beginning, but came around soon enough once the proper information was provided. It seems like the perfect time to delve back into Middle-earth and finish up all the quests that you’ve been hem-hawing around on, because once the new expansion hits – you’re going have to be a level 65 if you plan to survive it solo.